Missouri Education Watchdog: Common Core Proponent & Foundation for Excellence Member Mitchell Chester: Let Them Eat Cake? 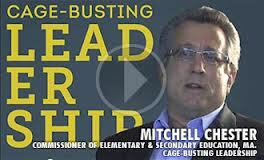 Common Core Proponent & Foundation for Excellence Member Mitchell Chester: Let Them Eat Cake? Start at the 1:10:00 mark to hear Chester say, essentially, if it will help kids, people simply have no “right” to object to the Common Core based on costs. Dr. Chester began his career as an elementary school teacher in Connecticut. He was a middle school assistant principal and a district curriculum coordinator. He has served in multiple leadership roles, including Chief of the Bureau of Curriculum and Instructional Programs for the Connecticut State Department of Education, Executive Director for Accountability and Assessment for the School District of Philadelphia and Senior Associate Superintendent for Policy and Accountability for the Ohio Department of Education. Dr. Chester holds a doctorate in Administration, Planning, and Social Policy from Harvard University, as well as advanced degrees from the University of Connecticut and the University of Hartford. It's no wonder Dr. Chester would make such remarks to Neal McCluskey. Foundation for Excellence is Jeb Bush's organization pushing various education reforms that take away state/local decisions for the educational development/delivery for students. Think of it as one big elite think tank developing reforms for us little people.